For southern New Hampshire residents who want to take a walk or a bike ride through nature, the Londonderry Rail Trail has been a welcome addition. 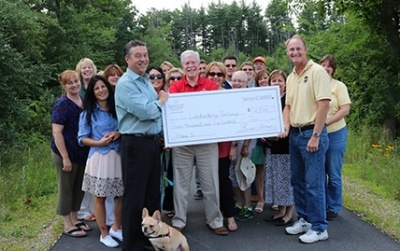 Berkshire Hathaway HomeServices Verani Realty (Verani) is a neighbor of the rail trail, and recently held a celebration on the trail to present Londonderry Trailways, a nonprofit, all-volunteer organization dedicated to improving access to recreational trails in Londonderry, with $2,500 to help expand it. The donation was made through VeraniCARES, the company’s philanthropy and social development initiative where agents and staff have the opportunity to raise fund through donations. Verani Realty then matches a portion of each donation. The Londonderry Rail Trail is a cooperative effort between Londonderry Trailways and the Town of Londonderry to complete six miles of trail on an abandoned rail corridor in North Londonderry. Londonderry Trailways recently obtained funding at town meeting for phase 4, a critical piece that crosses Route 28, and will start work on it next month. The VeraniCARES donation officially kicked off funding for phase 5, which they plan to tackle next year. Londonderry Trailways is dedicated to improving access to recreational trails in Londonderry. The Londonderry Rail Trail project started in 2012 and is approximately 50% complete. The goal is to connect it with the Derry and Manchester rail trails, making it part of the 20-mile project known as the Granite State Rail Trail. Visit www.londonderrytrails.org to learn more. To learn more about VeraniCARES, visit verani.com.